When my second popup sold out, I wondered if this week could get any better. I am thrilled to announce that I will be the guest chef at the Phoenix Artist Club in London’s West End for three nights from Wednesday 26 August to Friday 28th. I feel honoured to have been asked because the Phoenix is steeped in the history of the creative arts. It is a magnet for anyone working on stage and screen, looking for a place to unwind that is full of character. Harry Potter scenes were filmed right outside its doors. The venue itself, below the Phoenix Theatre on Charing Cross Road, served as the the theatre’s original rehearsal and dressing rooms. Sir Laurence Olivier made his stage debut in Noel Coward’s Private Lives from these very rooms. And it is from these same rooms that I will be serving my menu. There will be a choice of starters, mains and desserts as well as some freshly made bar snacks if you just want to pop in for a drink and a nibble. Sit, surrounded by decades of memorabilia, much of it signed, and take in the atmosphere. The bar is nicknamed ‘shuts’ – by all the performers who go there after they have finished their own shows – because it never does. You never know who might drop in after appearing on stage to give an impromptu performance. You can just turn up for drinks or dinner, but why not book so you don’t risk missing out? You can book through the Opentable website or app. Here is the menu we are offering. / Comments Off on Second pop up sells out! Second pop up sells out! 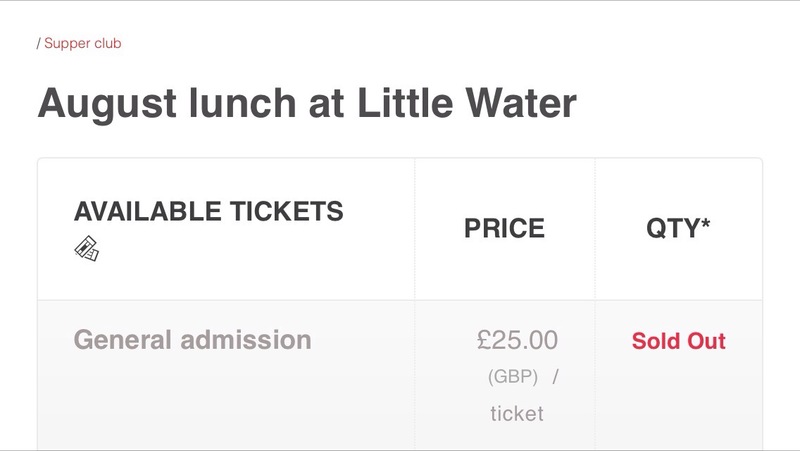 It felt great waking up this morning to find that my pop up restaurant event for Sunday 23rdat Little Water had sold out. Developing a menu, cooking my food and serving it to people who say how much they have enjoyed it is one of the most fulfilling feelings. Thank you to everyone who bought a ticket and to everyone who has been so supportive of this crazy dream.